Like an itch you can’t quite scratch, the wind Production Tax Credit (PTC) is a lavish subsidy that refuses to go away. Created by the Energy Policy Act of 1992, the PTC provides a tax credit of $23 per megawatt hour (MWh) of wind production. The PTC has grown substantially in both size and scope in the last year. The PTC was set to expire at the end of 2012 before Congress passed a one-year extension as part of the fiscal cliff deal at a cost of $12 billion to taxpayers. Even with such heavy support for over two decades, wind power contributed just 3.5 percent of the electricity generated in the U.S. in 2012. 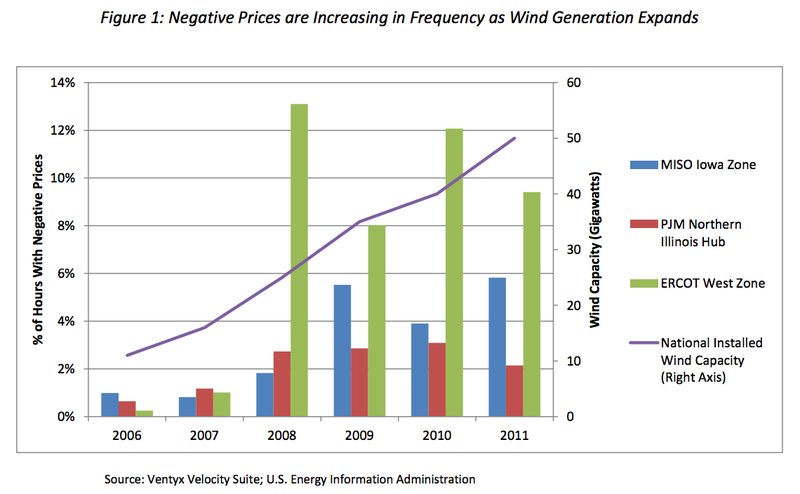 The Institute for Energy Research has consistently been critical of the Wind PTC because it, distorts electricity markets and costs taxpayers on average more than a billion dollars a year. [i] This blog post explores some of the results of the wind PTC. Wind is an intermittent and unreliable source of electricity generation. Wind energy only works when the wind is blowing. Due to this immutable law of nature, wind tends to produce most of its electricity during off-peak hours when electricity demand is low, as opposed to during the mid- to late-day when demand is high and power is needed the most. One of the biggest problems with the PTC is that it provides incentives for wind producers to sell electricity to the grid at “negative prices.” In other words, the PTC subsidy is so excessive that wind producers frequently pay the grid to take their electricity. Since the PTC provides a tax credit of $23 per MWh regardless of how that power is valued on the market, wind producers can actually pay the electrical grid to take completely unwanted power and still make money. In addition to transmission congestion, negative pricing caused by the wind PTC can negatively impact other energy sources like coal, nuclear, and natural gas power plants. As opposed to wind, these are reliable sources that can meet continuous energy demand. In fact, wind actually depends on so-called base load sources as back up when the wind it not blowing. Base load sources—such as coal, natural gas, and nuclear—are essential to maintaining grid reliability. Despite the importance of base load generation to the reliability of the electric grid, the PTC unfairly tilts the scales in favor of intermittent, unreliable wind generation that generally fails to perform when power is most needed. The resulting market distortions provide perhaps the strongest case for ending the PTC. The PTC is a massive waste of taxpayer dollars. Perhaps worse, the PTC distorts energy markets by allowing wind producers to actually pay the grid to take their electricity so they can continue to collect federal largesse. This harms reliable energy sources like natural gas that Americans depend on keep the lights on. It is long past time for Congress to let the PTC permanently expire. IER Policy Associates Travis Fisher and Alex Fitzsimmons co-authored this post. [ii] Timothy D. Mount, Surin Maneevitjit, Alberto J. Lamadrid, Ray D. Zimmerman, and Robert J. Thomas (2012). “The Hidden System Costs of Wind Generation in a Deregulated Electricity Market.” Energy Journal. [iii] U.S. Department of Energy, Energy Information Administration (2012). “Negative Wholesale Electricity Markets Indicate Supply Inflexibilities.” Today in Energy, February 23. [v] Chi-Keung Woo, Ira Horowitz, Brian Horii, Ren Orans, and Jay Zarnikau (2012). “Blowing in the Wind: Vanishing Payoffs of a Tolling Agreement for Natural-Gas Fired Generation of Electricity in Texas.” Energy Journal.